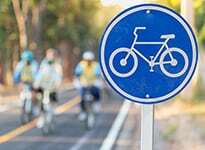 A Prevention Centre project that is addressing risk factors for chronic disease by making cities more liveable has been featured in a major Lancet series on urban design, transport and health. The series, launched in New York to world leaders in sustainable urban design, reported that increasing the amount people walk by 10% through better urban design would result in a 19 per cent drop in cases of cardiovascular disease and 14% drop in diabetes in Melbourne. However, urban design alone is not enough, said series co-author and Prevention Centre chief investigator, Professor Billie Giles-Corti. To encourage more active transport and reduce driving, more needs to be done at a regional planning level to increase employment accessibility and reduce the amount of parking, she said. “I have realised over many years of research that you might have a walkable neighbourhood that encourages people to walk more locally, but if people are living on the urban fringe and are spending two hours driving to and from work, they naturally will have less time to walk,” Professor Giles-Corti said. The series called for the health sector, including health ministers, to take the lead in advocating for more liveable and sustainable cities to reduce the burden of chronic diseases. It also recommended better integration of urban planning, urban design and transport policies and practices at both local and regional levels, and the establishment of a set of indicators to benchmark and monitor progress towards creating more compact cities that promote health and reduce health inequities. The first paper, written by Professor Giles-Corti of the University of Melbourne, showed that it was necessary to integrate eight urban policies – transport, social and health services, education, employment and economic development, land use and urban design, housing, public open space and recreation, and public safety – to achieve better wellbeing and health. The second paper, by Professor Mark Stevenson from the University of Melbourne, used modelling to show that creating ‘compact cities’ in different continents could significantly reduce chronic disease and improve air quality. However, compact cities would also result in a small increase in road trauma, so it was essential to build infrastructure that made it safe to walk and cycle. The paper showed how young, low-density, and highly motorised cities, such as those in North America, Australia and New Zealand, had unhealthy patterns of land use and needed new density and zoning policies to create more liveable cities. The final paper in the series, by Professor James Sallis from the University of California San Diego, drew on examples in the United States, Europe and Australia where progress was being made to translate evidence into policy and practice. “There are some things researchers can do, but there also needs to be a commitment from policy makers to use the evidence to make better policy,” Professor Giles-Corti said.